How foolish of me to have posted a Lumpia recipe without even mentioning the perfect dip to go with it! 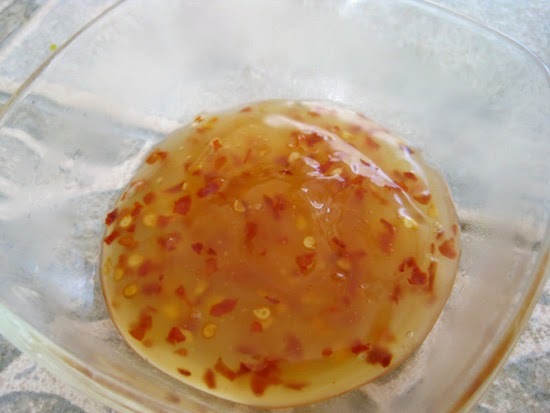 !--Sweet Chili Sauce along with Sriacha are probably my 2 favorite condiments of all time (next to mayo and ketchup). Particularly with protein whether it's chicken, fish, steak, even in a BBQ sauce, and of course egg rolls, I enjoy a side of this sauce. The bottled kind is more mild, sweet, but still extremely delicious. My version is more tailored to my more spicy and less tart preference, which is why I was so excited to have learned how to make this. I thank the youtube channel called RunnyRunny9 for the basic tips! I also added some salt for a little depth. Over medium heat, combine water, vinegar, and sugar in a medium sauce pot. Heat until sugar is fully dissolved. In a separate container (small bowl) dissolve corn starch (1 teaspoon) in cold water (1 teaspoon). Add into pot. Lower heat and continue stirring until sauce thickens.